HandBrake Guide: How to Convert DVD to iPhone XR/XS/XS Max etc. iPhone offers users amazing viewing experience thanks to its retina HD display with a 2436-by-1125-pixel resolution at 458 ppi, 1920-by-1080-pixel resolution at 401 ppi, 1334-by-750-pixel resolution at 326 ppi, etc. Not only can you play digital videos on iPhone, but also you can play DVD on iPhone. Certainly, you can't play DVD on iPhone directly, because DVD format is not supported by any iPhone model natively. You need a third party DVD to iPhone converter to duplicate a digital copy that is playable on your iPhone. If you don't want to spend a penny in a DVD converter, Handbrake is highly recommended. Handbrake is an open-source and cross-platform (Windows, Mac, and Linux) video transcoder capable of converting DVD to iPhone and other gadgets. However, HandBrake doesn't come with optimized presets for latest iPhone model, say iPhone Xs (Max) and iPhone Xr. We can only see some general presets for Apple devices in HandBrake. Therefore, we will show you how to create iPhone preset, iPhone 8 Plus preset for instance, and guide you how to convert DVD to iPhone with Handbrake. 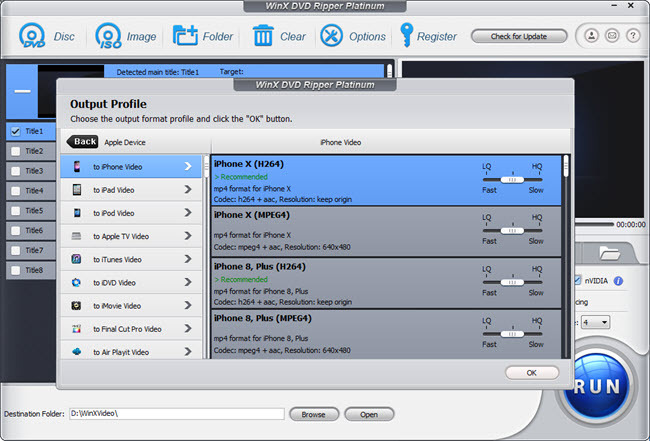 WinX DVD Ripper Platinum - Rip nearly Any DVDs including copy protected DVDs to iPhone (Xs/Xr/X/8/7 etc.) and other popular devices. Optimized device presets are prepared. How to Create iPhone Preset on HandBrake? The latest HandBrake has six iPhone releated output device profiles and they are: Apple 1080p60 Surround, Apple 1080p30 Surround, Apple 720p30 Surround, Apple 540p30 Surround, Apple 240p30 under Devices; and iPhone & iPod touch at Legacy category. Since there's no specific iPhone model presets. If you often use HandBrake to convert DVD to your iPhone, you can add a preset for it in advance. Let's take creating iPhone 8 Plus preset on HandBrake 1.1.0 as an example. Step 1: Open HandBrake, and load DVD video. Step 2： Click round "+Add" icon at the right bottom to pop up a specific preset dialog box. Step 3: Tap preset name and description into black bar, and define picture size as source original or custome it to certain one (1920x1080 at most). Audio and subtitles are also available to set at will. At last, click "Add" to finish. 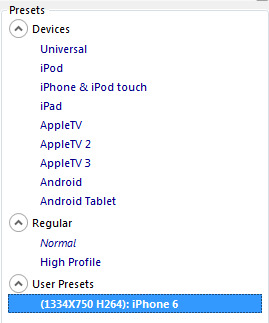 Then the iPhone preset would appear under "User Presets" list, which can be set as the default preset. 1. Open HandBrake folder: Hit Win+R, then paste %appdata%\Handbrake, and you will see two preset files in the folder: presets.xml and user_presets.xml. 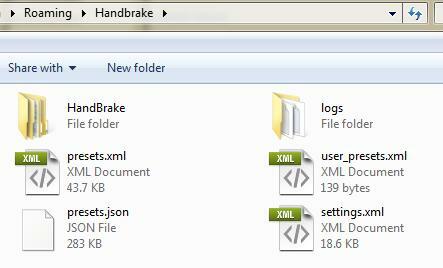 These two folders contains Handbrake original presets. Right click user_presets.xml and open it with notepad. 2. Delete all original content and replace the tags below, then save and close notepad. 3. 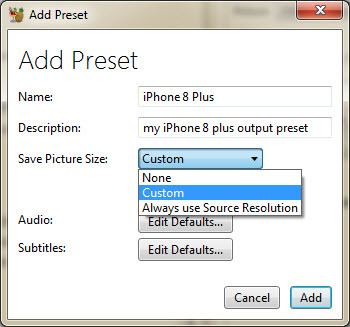 Reopen HandBrake, and you'll check the handbrake iPhone 6 preset in its Presets window. Please be noted that HandBrake itself can't convert copy-protected DVDs. Step 1. Click "Open Source" to load the DVD you want to convert for further playback on iPhone. Then, choose the title and chapter you need. Step 2. Click "Browse" to specify save path and name the output file. Step 3. Choose the iPhone preset you just created. Step 4. Hit "Start Encode" to begin converting DVD to iPhone supported format. Comparing with GUI (Graphical User Interface), machine language is much harder to understand and handle with (it is quite normal to encounter with unexpected crashing and breakdowns). Besides, rather than grabbling around to find HandBrake iPhone preset settings (though you can download them anywhere, it must be a time-consuming labor and you are not ensured that the preset is suitable for your iPhone), why don't you simply find HandBrake alternative software to convert your DVD to iPhone X/8 etc? Though Handbrake is greatly improved since V0.9.9 to the latest V1.1.0 (more than 1000 enhanced features and piles of bugs fixed), there still are some shortcomings that force users to find a Handbrake alternative. 1. When trying to convert DVD to iPhone, the conversion process must be involved with H.264 encoding. H.264 encoding will consume great portion of your CPU, and cause superfluous heat which harmfully over heat your iMac, MacBook or Mac Pro. Some Handbrake alternative software will rescue your Mac from this trouble, like WinX DVD Ripper for Mac. It features CPU usage controlling ability, so you can regulate the "House power" of your CPU's capacity. This encoding will not only maximally speed up your DVD ripping process, but also bring minimal damage to Mac. 2. Handbrake sometimes is not as stable as you expected when converting Sony, Paramount and Disney encrypted DVDs. For example, error: This version of handbrake is 64, VLC found but not 64 (learn how to fix Handbrake 64 VLC Error). 3. Sometimes Handbrake users need great expansion of input and output options. HandBrake only supports M4V, MP4, MKV output formats, even doesn't support AVI any more. Handbrake 0.9.9 acknowledged instability when converting DVD/Video to Xbox/PS3. But some Handbrake alternative will help you out with hundreds of video/audio codecs equipped with, like VideoProc. 4. Handbrake doesn't offer decent performance upon Windows PC. You can use WinX DVD Ripper Platinum when ripping DVD on Windows OS. There just are innumerous advantages that surpass HandBrake anyway. It can make perfect 1:1 copy (disc to disk) with 5 minutes, give constantly update to support latest DVD copy protections and more. And, specifc iPhone presets will save your time to convert DVD for iPhone. To sum up, if you are not masterful at computer or software stuff, it is truly a hard ball game to create iPhone preset on HandBrake and convert DVD to iPhone. But with the best Handbrake alternative - WinX DVD Ripper Platinum, you are able to convert DVD to iPhone without adding preset, damage of computer or the help of any other third-party tool to decrypt copy protected DVD movies. Better still, WinX DVD Ripper Platinum is capable of using both Intel QSV and Nvidia CUDA hardware accelerations, while HandBrake only embraces Intel QSV. Digitize virtually all unprotected and copy-protected discs with removal of various schemes like CSS, region code, RCE, Sony ArccOS, Disney DRM and others. Here's a detailed Handbrake DVD Ripper Windows tutorial on how to rip DVD and convert video using it on Windows 10/8.1/7/XP PC. This article will lead you to rip DRM-ed DVD with HandBrake correctly and introduce a much easier and faster way to decrypt copy-protected DVDs. What is the best settings for HandBrake to convert DVD to MP4 for playing on Plex, Roku, iPhone, Android, etc? Here are best HandBrake settings for DVD/Bluray to MP4.